Amazon Price: $249.99 (as of January 24, 2019 7:55 pm - Details). Product prices and availability are accurate as of the date/time indicated and are subject to change. Any price and availability information displayed on the Amazon site at the time of purchase will apply to the purchase of this product. 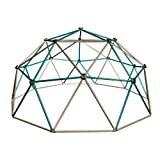 Lifetime Dome Climber Play Center provides a 10Foot Radius climbing structure for 3 to 10 year old children. If you’re looking for big toys to keep the kids entertained in your own backyard, check out this awesome big toy from Lifetime–the geometric Dome Climber. This is a big toy that several kids can enjoy at the same time. Big toys like our Dome Climber help your child to develop strong muscles and coordination. Our Dome Climber is a fun, geometric design with real rock climbing hand grips. It is constructed of powder-coated steel to prevent rusting and peeling. Like all of our big toys, the Dome Climber is made from top-quality construction, and built to last—a big toy that will be a backyard attraction for many years. Constructed with 1.5" diameter and 33" lengths of tubing.